Following a 20-plus year international career in Banking, in 2012 Greg joined HomeServe Membership, the biggest business in the HomeServe Group, as its UK Chief Marketing Officer, becoming CEO in June 2017. Greg now leads a business of over 3,000 People, including 1,000 field engineers, with 2.1m Customers and a turnover in 2017 of £326m. When he joined, in the UK HomeServe had been through a regulatory, reputational and commercial near-death experience and Greg was part of a new exec team brought in to create and drive a culture that would help a new HomeServe to emerge; a commercially powerful business built on strong principles with the right culture of committed People delivering effortless service to Customers. In 2017, Glassdoor recognised HomeServe Membership as one of the ten best places to work in the UK, for the second year running. In the same year, Greg was named 'Best Leader' and 'Most Progressive Workplace Leader' at the Talent Unleashed Awards. One of Greg’s focus areas has been innovation and through his leadership, HomeServe is now a recognised InsureTech company through its wholly-owned subsidiary HomeServe Labs. Its first product, the award-winning Leakbot, is now in commercial production. 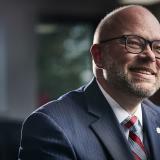 A native of Smyrna, Delaware, Greg’s undergraduate degree was in Finance from Pennsylvania State University and he also holds a doctorate in Law from Widener University School of Law. Greg lives in Edinburgh with his childhood sweetheart Melissa and their three children. His best friend is his border collie, Piper. Check out the incredible speaker line-up to see who will be joining Greg .